Power of Laughter - Download | Laughter Therapy Enterprises, Inc. Here is a fantastic resource for all mental health professionals...and for anyone interested in their own mental health. This two hour video provides important information on laughter and its healing power (both emotionally and physically). 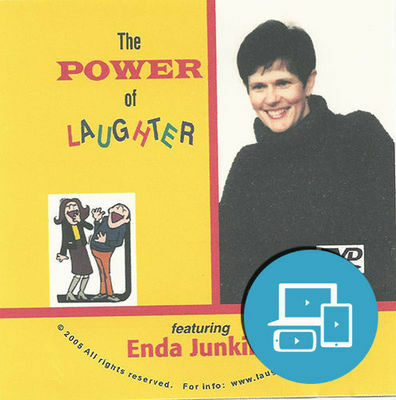 Clinical social worker Enda Junkins demonstrates very specific and practical laughter techniques in an entertaining way while sharing the secrets to help you reconnect with your own laughter more spontaneously! She also focuses on : 4 myths about laughter, the difference between laughter and humor, the therapeutic power of laughter as cathartic release, and laughter as a tool to move from resisting pain to resolving and playing with pain. You'll have a twinkle in your eye as you learn exciting, powerful techniques which can stimulate healing like nothing else on earth.